Regional IPNI director Dr Rob Norton presents Brooke Ryan with the IPNI Scholars award along with the University of Adelaide's Dr Annie McNeill. The presentation was made at a symposium on soil carbon conducted by Soil Science Australia and the Australasian Soil and Plant Analysis Council in Adelaide, South Australia. 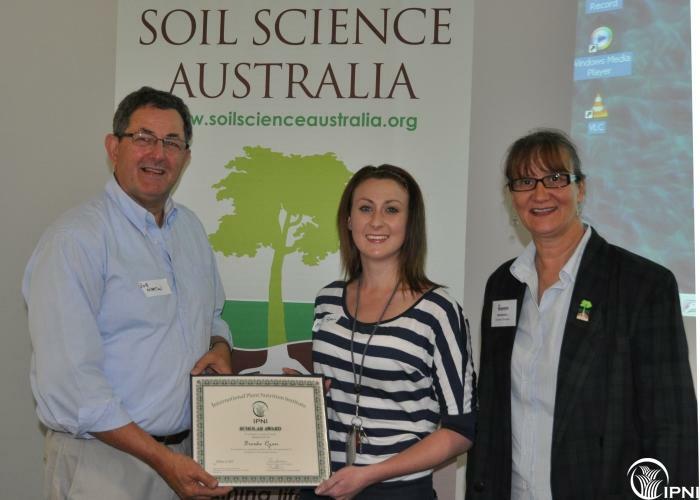 Brooke Ryan is the Australia/New Zealand recipient of the 2011 International Plant Nutrition Institute Scholar Award. She was selected from a very talented field of applicants from across Australia and New Zealand. The individual award of USD 2,000 (two thousand dollars) is available to graduate students enrolled in science programs relevant to plant nutrition and management of crop nutrients. Ms.Ryan is working toward her Ph.D. at the University of Adelaide in Adelaide, Australia. Her dissertation title is “The Isotopic Discrimination of Copper in Soil-Plant Systems” which aims to use stable isotopes of copper (63Cu and 65Cu) and their fractionation to examine the source, behavior, and plant uptake mechanisms of copper within the soil-plant environment. The information gained from this work could potentially be used to develop models to track natural and anthropogenic copper in terrestrial environments, and improve crop management practices for increased fertilizer efficiency, crop growth, and micronutrient content. For the future, Ms. Ryan’s goal is to pursue a career in research working on environmental protection and remediation, especially in the area of heavy metal contamination. The selection committee adheres to rigorous guidelines in considering important aspects of each applicant’s academic achievements. Funding for the Scholar Award program is provided through support of IPNI member companies, primary producers of nitrogen, phosphate, potash, and other fertilizers. Graduate students must also attend a degree-granting institution located in any country with an IPNI Program. Ms Ryan is one of 20 scholars receiving the award globally.